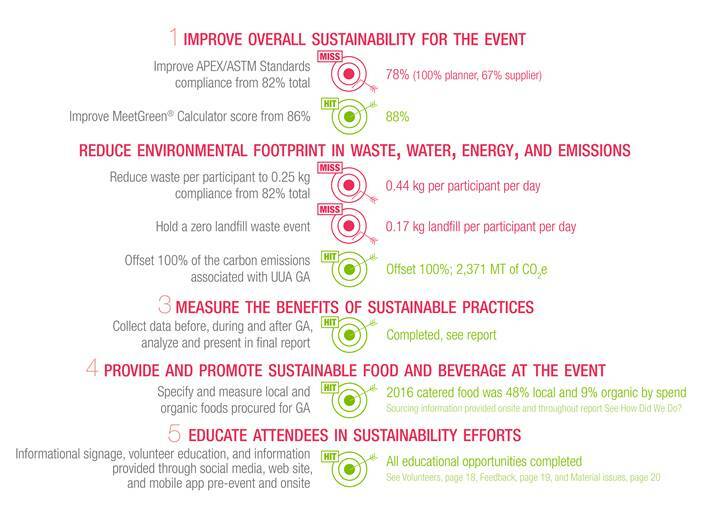 The Unitarian Universalist Association (UUA) has been implementing event sustainability best practices through General Assembly (GA) since 2004. Each year, GA is held in a different city, bringing new challenges and opportunities. UUA has been able to collaborate with vendors across the country to improve existing sustainability efforts through the development of a formal event sustainability strategy. In 2016, UUA GA continued by working with the host location Greater Columbus Convention Center (GCCC) and Columbus hotels. The Unitarian Universalist Association identified five main sustainability objectives for General Assembly 2016. Each objective is accompanied by individual targets and action items designed to address and evaluate each objective. These targets are customized given the current level of sustainability in each host city prior to the event. Sustainability is addressed at every step of the General Assembly planning process. Environmental initiatives are included in contract language several years before the event, and work is done with vendors throughout planning to ensure objectives are being met. This focus on pre-event, onsite, and post-event work aims not only at internal improvements at GA, but helps engage vendors in a way that promotes long term change and impact. For the second consecutive year, 100% of the carbon emissions associated with GA were offset. 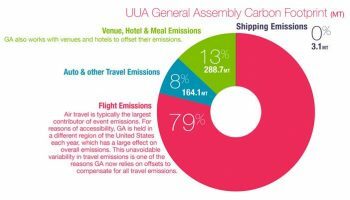 GA has historically required that hotels and venues offset their carbon emissions associated with hosting GA, but the largest contributor, attendee travel, has been offset voluntarily by GA attendees. 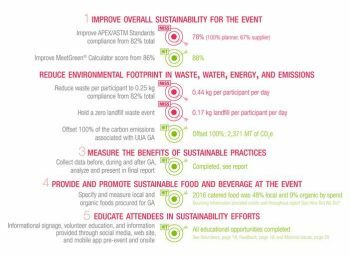 Each year since 2006, GA attendees have been given the option to make a donation to offset their per-person portion of the event’s overall carbon emissions, and these voluntary offsets often reached 50% of the total event-related carbon emissions. Again this year, GA worked with Carbonfund.org to calculate and offset 100% of the carbon emissions from all attendee air and ground travel, and all materials freight shipments to and from Columbus. “In 2016, I’m especially proud of the work that we’ve done in Columbus to offset the carbon emissions associated with GA for a second time, from shipping and hotels, to attendee travel,” states Rev. Chip Roush in the GA ’16 Sustainability Report. Roughly half of the offsets purchased will support the Truck Stop Electrification Project, helping to provide electricity to truckers during rest periods and eliminate the emissions and air quality concerns from idling. The other half will go to the LifeStraws Carbon for Water Project, which uses carbon financing to sustainably provide millions of people with clean water in Kenya. With the theme of “Heart Land: Where Faiths Connect”, the 2016 General Assembly focused on racial justice and equality for all. A particularly powerful moment came when Glen Thomas Rideout, director of music and worship at the UU Congregation of Ann Arbor, Michigan, sang David Frazier’s gospel song, “I Need You To Survive,” backed by the 180-person General Assembly choir. Clearly, UUA and its members also need – and want — the Earth to survive and are continuing to lead the way through these significant sustainability initiatives. Earth Day – May Caribbean Vacation Sweepstakes Winner Announced and More Trees Planted!